The United States Geological Survey has been tracking a series of earthquakes near Bombay Beach, California. This “earthquake swarm” is happening under the Salton Sea, and over 140 events have been recorded since Monday September 26. The quakes range from 1.4 to 4.3 in magnitude, and are occurring at depths between 2.5 to 5.5 miles (4 to 9 km). For seismologists, these quakes could represent some seriously bad news. The swarm is located near a set of cross-faults that are connected to the southernmost end of the San Andreas Fault. Troublingly, some of these cross-faults could be adding stress to the San Andreas Fault when they shift and grind deep underground. Given this region’s history of major earthquakes, it’s got some people a bit nervous. Calculations show that from now until October 4, the chance of a magnitude 7 or greater earthquake happening along the Southern San Andreas Fault is as high as 1 in 100, and as low as 1 in 3,000. On the plus side, the likelihood of it happening decreases with each passing day. These estimates are based on models developed to assess the probabilities of earthquakes and aftershocks in California. “Swarm-like activity in this region has occurred in the past, so this week’s activity, in and of itself, is not necessarily cause for alarm,” cautions the USGS. 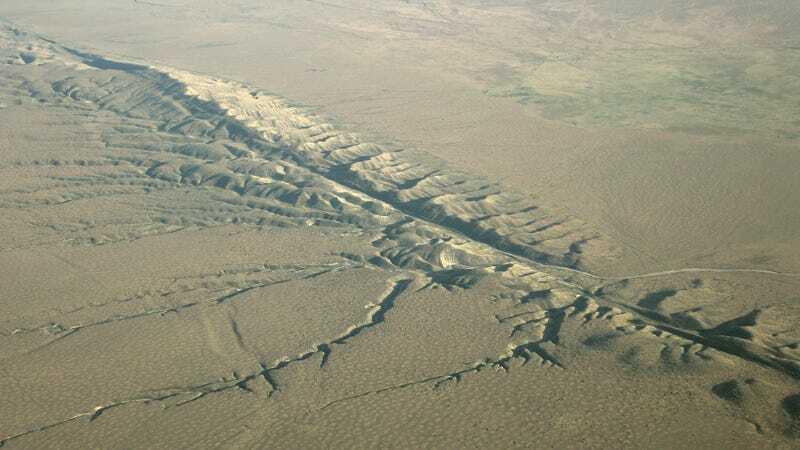 A big fear is that the rupturing of the southern portion of the San Andreas fault could cause a domino effect along the entire stretch, cracking the fault from Imperial County through to Los Angeles County. Another possibility is that the Salton Sea swarm could cause the nearby San Jacinto fault system to rupture, which would in turn trigger the collapse of the San Andreas Fault. But as the USGS researchers point out, this is far from an inevitability. The swarm under the Salton Sea may subside, or fail to influence the gigantic fault nearby. Moreover, the estimates provided by the scientists are exactly that—estimates. The science of earthquake prediction is still very much in its infancy, and these models are very likely crunching away with insufficient data. No need to panic just yet.